8 Voted against support for "Contras"
9.4 Public "wants test ban"
Edward J. Markey is a Democratic Senator from Massachusetts. He was previously a member of the United States House of Representatives, representing the 5th district of Massachusetts. Ed Markey was born in Malden, Massachusetts, on July 11, 1946. He attended Boston College (B.A., 1968) and Boston College Law School (J.D., 1972). He served in the U.S. Army Reserve and was elected to the Massachusetts State House where he served two terms representing Malden and Melrose. He is married to Dr. Susan Blumenthal. Representative Edward J. Markey, a national leader on energy and the environment, is the Ranking Member of the Natural Resources Committee. He has served on the Committee since his election to the House of Representatives in 1976. In addition to being a steward of our public lands, national parks, and oceans, Rep. Markey has fought to create new jobs in American clean energy. He also consistently served as consumer champion against rising gas prices and foreign oil. From 2007 to 2010, at the direction of then-Speaker Nancy Pelosi, Rep. Markey served as Chairman of the Select Committee on Energy Independence and Global Warming. The Select Committee has held 80 hearings and briefings and contributed to the advancement of smarter energy and climate policies, including the first increase in fuel economy standards in three decades, which Rep. Markey authored. During the 111th Congress, Rep. Markey also chaired the Energy and Environment Subcommittee of the House Energy & Commerce Committee. Perhaps the most powerful Subcommittee in the House of Representatives, it had unprecedented jurisdiction over national energy and environmental policy. As Chairman, Markey co-authored the landmark Waxman-Markey "American Clean Energy and Security Act," which was approved by the House of Representatives in June 2009. Reflecting his commitment to maintaining the quality of life and economic opportunity in New England and across America. Gene Karpinski, the President of the League of Conservation Voters of the United States, has said “there is no greater environmental champion in Congress than Ed Markey as we fight to head off the looming catastrophe of climate change,” and Kevin Knobloch, President of the Union of Concerned Scientists has said that Rep. Markey “is part of an exciting, game-changing leadership in the Congress on climate and energy.” President Obama has also noted that "the House of Representatives has already passed historic legislation" on energy and environmental issues "due in large part to the efforts of Massachusetts' own Ed Markey" noting in a speech in Boston that Markey “deserves a big round of applause” for his leadership in drafting the Waxman-Markey bill. Opposing Ted Kennedy in the 1962 Massachusetts Democratic Primary was Edward McCormack, nephew of House Speaker John McCormack; Kennedy's Republican opponent was Yankee scion George Cabot Lodge; and on the left was Independent peace candidate Harvard Prof. H. Stuart Hughes, chair of the Committee for a SANE Nuclear Policy. Hughes needed 72,000 signatures, a purposely prohibitive number in that era of McCarthyism and nobody in fact had tried to reach it since the law had first been passed. The Vietnam War had personal as well as political consequences for Steve Grossman. At Harvard he signed an anti-war petition, despite the warnings of career-conscious classmates who said it would harm his chances to get a job. Later, he accelerated his business-school program and joined the US Army Reserves, which fulfilled his military obligations. That's where he met Ed Markey, a young man from Malden. "We were always talking about politics," Markey remembers. When Markey announced that he was running for a congressional seat in 1976, Grossman called to offer his family's support. In the early 1960s SANE "recognized the environmental and health impact brought on by the nuclear age". In 1962, convinced that nuclear testing would have a negative effect on generations of children, Dr. Benjamin Spock made an "inspired move" to unite health care professionals with the nuclear abolition movement. SANE’s Executive Director, Homer Jack, convinced Spock to go public with his beliefs. The New York Times advertisement declared “Dr. Spock is Worried” and "our nation took to the streets in defense of children and the environment". The connection was clear. Nuclear testing left radiated uranium deposits in the soil and water table. Once dispersed, the radiation infected the grass and grazing animals - moving its way through the ecosystem into our food supply and into our bodies. At a late 2000s Peace Action Congressional book reception, Congressperson Ed Markey commented on this truth and how Dr. Spock inspired him as a teenager to get involved in the nuclear abolition movement. During the 1979 SALT II debate, Oregon's far left Republican Senator Mark Hatfield introduced an amendment that called for a “strategic weapons freeze,” which helped provide the impetus for the popular Nuclear Weapons Freeze Campaign and would ricochet back into Washington and prompt Hatfield and other members of Congress to act. As tensions between Washington and Moscow mounted in 1982 and the two countries built up their nuclear arsenals even further, Hatfield and other members of Congress 'heard from their constituents", who sought a way off the escalatory ladder and were calling for a “nuclear freeze” with the Soviet Union on the testing, production, and deployment of nuclear warheads and delivery systems. “We heard from people at every stop who knew about the nuclear freeze proposal and wanted us to support it. ‘Why not?’ they asked. We found that question difficult to answer,” Hatfield and Senator Edward Kennedy (D-Mass.) later explained in their 1982 book Freeze! How You Can Help Prevent Nuclear War. “A new arms control initiative was needed to offer leadership in Congress and respond to the growing public concern,” they wrote. On March 10, 1982, Hatfield and Kennedy joined House proponents of the freeze, including Representative Edward Markey (D-Mass. ), to introduce a “sense of Congress” resolution based directly on a widely disseminated document, “Call to Halt the Nuclear Arms Race,” developed by Randall Forsberg, a Massachusetts Institute of Technology defense policy expert who would later join the board of directors of the Arms Control Association. With the backing of Hatfield and Kennedy, the effort gained broad-based popular and expert support, national attention, and increasing political momentum. Following new Soviet leader Mikhail Gorbachev’s announcement in July 1985 that the Soviet Union would forgo tests and that the Soviet Union would not test until and unless the United States began testing, the Reagan administration declined to reciprocate. In October 1986, a bipartisan group of 63 House and Senate members, led by Hatfield, Senator Alan Cranston (D-Calif.), Representative Les Aspin (D-Wis.), and others, sent a letter to Reagan urging him to reciprocate and call off the next scheduled test in Nevada, code-named Glencoe. Cranston and Hatfield also introduced legislation seeking to bar the spending of money to carry out U.S. nuclear tests if the Soviet Union was not doing so. Their initiative did not succeed, but it would get another chance. The freeze campaign became the strongest of the nation-wide American political initiatives during the eighties. In Randall Forsberg’s paper, “The Call to Halt the Arms Race,” she suggested an immediate, verifiable, comprehensive, bilateral cessation of production, testing, and deployment of new nuclear weapons and delivery systems.Actual disarmament could be deferred. The strategy was originally developed by several East Coast disarmament and peace organizations in 1980, which included AFSC, FOR, Clergy and Laity Concerned , and a research organization headed by Forsberg, the Institute for Defense and Disarmament Studies. Among the key organizers of the campaign were Pam Solo (then a Loretto nun) and Randy Kehler. The freeze idea caught the imagination of the public and a national poll showed that in April 1982, 81 percent of the public approved it. The freeze movement faced a political dilemma: whether or not to work closely with such politicians as Senator Edward Kennedy and Congressman Ed Markey, who could improve the odds of turning the freeze idea into legislation but at the cost of narrowing the political demands. The organizers opted to work with the politicians, who introduced the Kennedy-Hatfield freeze resolution to the Senate, only to see the administration immediately try to stifle it. The freeze resolution in the House of Representatives passed in May, 1983, but some activists saw the votes in Congress as premature and ultimately counterproductive. Although the freeze movement was the most prominent American political campaign of the eighties, its strength came from a variety of other supportive peace groups, many of them older organizations that also sustained their own projects. Existing disarmament groups multiplied in size during the mid-eighties and hundreds of other new groups came into existence and briefly played important roles. The historic peace churches continued active, of course. Then there were old grassroots organizations such as WILPF, Mobilization for Survival, and the War Resisters League, plus lobbying groups in Washington, such as SANE and the Council for a Livable World. April 17, 1986, the Committee for a Sane Nuclear Policy said a poll it commissioned with Opinion Research Corp. of Princeton, N.J., also showed that 60 percent of U.S. citizens believe the United States should halt nuclear weapons testing as long as the Soviet Union stops its tests. The poll shows beyond a doubt that the vast majority of Americans want President Reagan to stop nuclear testing, especially before any second summit meeting, said David Cortright, executive director of the group. The poll results were announced as several members of Congress pushed for House consideration of an amendment to cut off money for nuclear weapons testing until the president certifies that the Soviet Union has conducted another test. The House Rules Committee agreed Thursday to allow consideration of the amendment in conjunction with a $1.7 billion supplemental spending bill scheduled to come up next Tuesday. The committee said debate and amendments to the testing cutoff would be limited to two hours. What we're trying to do is break the administration's testing habit - cold turkey, Rep. Ed Markey, D-Mass., said at a news conference with officials from the anti-nuclear group. Markey said he and Reps. Patricia Schroeder, D-Colo., and Tom Downey, D-N.Y., had planned to offer their amendment cutting off nuclear test funds Thursday on the House floor. But their vehicle, the supplemental appropriations bill, was pulled off the floor Wednesday after an unusual parliamentary maneuver. According to the organization, governors or legislatures in five states - Washington, New York, Hawaii, Ohio and Rhode Island - have adopted test ban resolutions. More than 60 communities in 13 states have passed similar resolutions, the group said, while 25 Nobel laureates signed an April 8 letter to Reagan urging him to stop testing until a summit or until the Soviet Union resumed testing. SANE also released a nuclear test ban endorsement signed by five former high-ranking government officials including former CIA director William Colby; former arms control negotiator Paul Warnke; former scientific director Jerome Weisner; former deputy secretary of the Air Force Townsend Hoopes; and former deputy assistant defense secretary Adam Yarmolinsky. Ed Markey placed a tribute in the Congressional Record, October 23, 2007, to mark the death of "Nuclear Freeze" activist Randall Forsberg. Madam Speaker, it is with great sadness that I rise to mark the passing of my friend Randall Forsberg, but it is with pride, admiration, and thankfulness that I remember her enormous contributions to the cause of nuclear disarmament. Randy Forsberg was the mother of the Nuclear Freeze movement. When she was a doctoral candidate at the Massachusetts Institute of Technology in 1980, she put forward a simple and inspired proposal: to end the ‘‘testing, production, and deployment’’ of all nuclear weapons everywhere. With her ‘‘Call to Halt the Nuclear Arms Race,’’ and her tireless advocacy for a nuclear weapons freeze, Randy galvanized a national grassroots campaign to end the threat of nuclear weapons. I was proud to introduce the very first nuclear freeze resolution in the Congress, and to work for its successful passage on the House floor in the spring of 1983. That vote shocked many within the dusty confines of the foreign policy establishment, who simply could not comprehend that ordinary citizens understood the unique and intolerable threat of nuclear weapons and that the American public would demand a fundamentally different course be set. Randy was at the center of the Nuclear Freeze throughout the country, and was a guiding light to many who believed in the necessity of the Nuclear Freeze. While the Freeze did not pass in the Senate, the activism that this movement created led the Congress to pass other legislation to cut in half the proposed size of the MX missile force, ban anti-satellite weapons testing in space, cut funding for Star Wars missile defenses, and to propose a moratorium on underground nuclear weapons testing. Those Congressional initiatives in turn, led the Reagan Administration— which came to office opposed to arms control— to sign the START and INF treaties with the Soviet Union. In order to advance a nuclear weapons freeze, Randy founded the Institute for Defense & Disarmament Studies in Cambridge, Massachusetts, in 1980. Since that time, IDDS has been an important part of the arms control community in the United States and abroad. Through its numerous publications, including its World Arms Database, IDDS has provided vital information and analysis to both policy makers and the public at large. Randy Forsberg passed away last Friday night, ending a long battle with endometrial cancer during which she had shown incredible bravery and dignity. My thoughts and prayers are with her daughter, Katarina Lilly, her mother, Genie Watson, and her sister, Celia Seupel. With Randy Forsberg’s death, the world has lost an eloquent and inspired advocate for nuclear disarmament. But the cause to which she devoted her life endures, and her example serves to inspire others who share her dream of a world without nuclear weapons. What the freeze movement did in the United States, like the Greens in Europe, was to bring nuclear strategy out of the elite foreign policy salons and move it to the grass roots, said Representative Edward J. Markey, a leader of the freeze campaign. Public education led to public activism, and public activism has seriously constrained decision-makers' options over the last six or seven years. It was the movement, combined with the rise of Mikhail S. Gorbachev in the Soviet Union, that created an irreversible momentum toward reduction of nuclear weapons on both sides, said Mr. Markey, a Massachusetts Democrat. Alarmed by the increased dangers of nuclear warfare in the post-Sept. 11 world, Representative Edward J. Markey and a group of veteran antinuclear activists sought to revive an old initiative - the movement for a nuclear freeze - to reinvigorate a worldwide campaign against the use and proliferation of nuclear weapons. In a news conference June 11,2002, Markey urged President Bush to renounce proposals that the US adjust its strategic doctrine to allow the first use of nuclear weapons, and said the United States should agree to a permanent end to the testing of nuclear warheads. The Bush administration is leading the country in the wrong direction in almost every aspect of nuclear policy, Markey said. Markey introduced a joint resolution that called for an end to the development, testing, and production of nuclear weapons, the ratification of the Comprehensive Test Ban Treaty, and greater efforts to stop the proliferation of nuclear technologies to rogue regimes such as North Korea and Iran. The resolution was offered 20 years after Markey played a major role in the nuclear freeze movement. Jonathan Schell, a leader in the original movement and a cofounder of Urgent Call to end nuclear danger, said the world faces a second nuclear age, with dangers that are springing up all over. Massachusetts representative Ed Markey introduced a House bill 7394, titled the Smarter Approaches to Nuclear Expenditures (SANE) Act of 2012 in the House of Representatives, in February. He was joined by 34 co-sponsors. Numerous organizations around the country, including OREPA, signed on in support of the legislation as it was being prepared. Congressman Edward J. Markey (D-Mass.) Floor Statement “Smarter Approach to Nuclear Expenditures (SANE) Act of 2012” Wednesday, February 8, 2012. “Mr. Speaker, America’s nuclear weapons budget is locked in a Cold War time machine. “It doesn’t reflect our 21st century security needs. It makes no sense. It’s insane. • It’s insane to spend $10 billion building new plants to make uranium and plutonium for new nuclear bombs when we’re cutting our nuclear arsenal and the plants we have now work just fine. • It’s insane that we’re going to spend $84 billion for up to 14 new nuclear submarines when just one sub can with 96 nuclear bombs on board can blow up every major city in Iran, China and North Korea. “It’s an insane strategy, but it’s our current plan. “That’s why we need a sane approach to our nuclear weapons budget. “Today I am introducing the SANE Act – the Smarter Approach to Nuclear Expenditures Act – with 34 of my colleagues. “The SANE Act cuts $100 billion in spending on outdated, wasteful nuclear weapons and related programs over the next ten years. Let’s cut new nuclear weapons and not programs for the poor, the elderly, the sick and the children of our country. I was delighted in early February to see that Representative Ed Markey has introduced a new bill in Congress, the SANE (Smarter Approach to Nuclear Expenditures) Act. Markey’s bill calls for significant reductions in nuclear weapons, for a savings of about $100 billion over the next 10 years. Markey remains, as he has been for more than 30 years, the most significant leader and articulate voice in Congress for nuclear arms reduction. I’m glad to see he is still at it. As the former executive director of SANE, I was thrilled to see renewed reference to the venerable SANE brand. When I was with SANE in the 1980s we worked closely with Markey. I continued to cooperate with him on disarmament initiatives after that—including the Urgent Call, a nuclear abolition appeal launched in 2002 with Jonathan Schell and Randy Forsberg. When I contacted Markey’s office recently to congratulate him for introducing the SANE Act and making reference to our organization, his staff said the SANE acronym was intentional, to recall the halcyon days of the 1980s when the Nuclear Weapons Freeze Campaign was sweeping across the country like a populist prairie fire and SANE was growing rapidly into a formidable mass membership organization. In 1982 Markey was the original sponsor of the Nuclear Weapons Freeze Resolution in Congress. Later that year he spoke before a million people in New York’s Central Park for the June 12 rally to freeze and reverse the arms race, the largest peace and disarmament rally ever held in the United States. SANE was actively involved in helping to organize that rally. In the late 1980s SANE merged with the Freeze Campaign to form a united organization that still exists today as Peace Action. At that time some board members of SANE were reluctant to see the name go. They didn’t want to lose the legacy and history of SANE dating from the late 1950s, reflected in the involvement of such luminaries as Norman Cousins, Steve Allen, Ben Spock, and Coretta Scott King. Since 1971, the far left Federation of American Scientists has recognized an outstanding statesman or public interest advocate who they believe has made a distinctive contribution to public policy at the intersection of science and national security. The award went to Ed Markey in 2007. In May 1984 Ed Markey, Mel King, Victor Weisskopf, John Pastore, Roberta Snow, Monica Eisenbud addressed a student peace rally in Copley Square Boston. Edward Markey signed the letter. As of February 20 2009 Edward Markey was listed as a member of the Congressional Progressive Caucus. On April 29, 2010, The Wilderness Society held a celebration for the 50th anniversary of Arctic National Wildlife Refuge. The Society's president, William H. Meadows joined Senators Tom Udall (D-NM) and Mark Udall (D-CO), together with Rep. Ed Markey (D-MA) in addressing the event. Also speaking were Luci Beach, Tom Campion, Brian Moore, Evan Hirsche, Mary Beth Beetham and Debbie Sease. Physicians for Social Responsibility , Rep. Edward Markey (D-Mass) and the Institute for Policy Studies' Robert Alvarez held a joint press conference on Tuesday, April 26, 2011, National Press Club, First Amendment Lounge, on the ongoing impact of the Chernobyl nuclear disaster to public health 25 years after the accident, the continuing nuclear catastrophe in Fukushima, Japan, and the lessons from both for U.S. public health and safety. PSR also unveiled a new online interactive Evacuation Zone Map. PSR doctors will outline how accidents such as Chernobyl and Fukushima pose a threat to the public's health and the real challenges of implementing evacuation plans in the event of an accident, especially near major metropolitan areas. Speakers will cover the latest findings regarding radiation exposure, the medical response to nuclear reactor accidents, and the implications of Fukushima and Chernobyl for US energy policy. .
"Just weeks" after the 2011 Egyptian revolution, Keith Ellison traveled to Egypt as part of a congressional delegation. The March 2012 delegation met with Field Marshal Hussein Tantawi and other high-ranking Egyptian government officials. While in Egypt, Nancy Pelosi and Members of Congress also met with civil society and religious minority leaders. In addition to Leader Pelosi, other Members of the Congressional delegation were: Congressman George Miller of California, Congressman Ed Markey of Massachusetts, Congressman Nick Rahall of West Virginia, Congresswoman Carolyn Maloney of New York, and Congressman Keith Ellison of Minnesota. Edward Markey landed another endorsement, January 2013, as the Council for a Livable World’s Board of Directors unanimously gave the veteran congressman a nod of support for his bid to become the Bay State's next U.S. senator. “As a Bay Stater, I’m proud to have voted to endorse Rep. Markey’s candidacy for the Senate,” said Priscilla McMillan, of Cambridge, who is described as an expert on U.S.-Russia relations and one of the group's board members. “Markey's courage and far-sightedness in nearly four decades of public service leading the effort for greater control of nuclear weapons and better protection of the environment make him the perfect successor to Senator Kerry." The organization says that it raised more than $200,000 to support Democratic U.S. Sen. Elizabeth Warren's successful campaign against ex-Republican Senator Scott Brown, and that it will throw its financial weight behind Markey. Ed Markey is a key leader in Congress on nuclear disarmament, nuclear power and climate change. He opposes the Afghanistan war and favors reducing military spending to fund social needs. Markey has worked for nuclear disarmament for decades. Markey’s Smarter Approach to Nuclear Expenditures (SANE) Act, named for Peace Action’s predecessor organization, would cut $100 billion in nuclear weapons spending from the Federal budget. He is a constant critic of the Nuclear Regulatory Commission’s lax oversight of nuclear power plant safety and was joint sponsor of the Waxman-Markey climate change bill. Markey has voted repeatedly against funding for the Afghanistan war and against the defense authorization and appropriation bills. He is a member of the Congressional Progressive Caucus, voted for its Budget for All progressive budget amendment in 2011, and supported the Budget for All non-binding question which the voters of 91 Massachusetts cities and towns passed by an average 3 to 1 margin in. Markey has not been a strong supporter of progressive positions on Israel/Palestine, and we hope to work with him in the future on these issues. Overall, his record on issues close to Peace Action’s mission is far better than that of Congressman Lynch. Markey will make the difference for peace and progress in the Senate. Make sure Ed Markey knows the peace movement cares about the Senate race! Attend one of Mass. Peace Action’s Markey campaign parties. We’ll raise funds and energy for Markey and explain why Peace Action supports him. We’ll be holding parties in Jamaica Plain, Cambridge, Newton, and Groveland in the coming weeks. Contact us for details! Donate to Markey’s campaign through our on-line donation page. Distribute our flyer, Ed Markey on War and Peace, to your friends and neighbors. Party for Ed Markey for Senate! On April 30th, there will be a special election to fill the Senate vacancy left by the now Secretary of State, John Kerry. 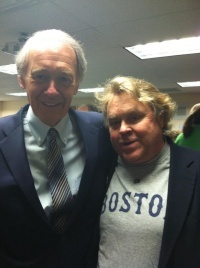 Please help Peace Action ally, Rep. Ed Markey, become the next Senator of Massachusetts. Rep. Ed Markey is a key leader in Congress on abolishing nuclear weapons. He is the U.S. co-president of Parliamentarians for Nuclear Non-proliferation and Disarmament, and his "SANE Act," named for Peace Action's predecessor organization, calls for cuts in spending on nuclear bomb production facilities, nuclear-armed bombers and submarines, the end of U.S. bombers' nuclear mission, and reduction in number of deployed weapons. You can send Markey to the Senate now. Markey has voted repeatedly against funding for the Afghanistan war and against the defense authorization and appropriation bills. He is a member of the Congressional Progressive Caucus, voted for its Budget for All progressive budget amendment in 2011, and supported the Budget for All non-binding question which was passed by the voters by a 3 to 1 margin in 91 Massachusetts cities and towns. With your support, Markey can become a Senator with more power to enact your, and Peace Action's, values. Progressive Democrats of America backed Ed Markey in his 2013 US Senate run. Progressive Democrats of America formally voted to endorse Ed Markey in his 2013 US Senate run. Progressive Democrats of America organized phone banking teams for Markey. Our core phone team has been working hard making calls for the past few weeks, and response has been great. But since Ed showed the sensitivity to suspend campaigning during the days after the tragedy in Boston, we now find ourselves a bit behind on our goal of total voter touches. The election is next Tuesday, April 30, so we have no time to waste. We need you to make some simple phone calls from the comfort of you home. We provide all the training you need, you decide your schedule--whether it's 10 or 15 minutes here and there, or a couple of hour shift--and when we talk with them the response is great! It's time for us to show solidarity with Ed Markey. Let me know you'll help right now and we'll have you up and running in no time. The vast majority like what Ed stands for. We just have to make sure they know they have to get out and vote April 30th! We regularly put thousands and thousands of calls into targeted endorsed candidates races. Whether it was Norman Solomon in CA or Alan Grayson in FL, PDA members from all across the country have poured the calls in from out of state to make a real difference. Thank you, thank you, thank you for anything you can do to bring this win home for all of us. Congressman Ed Markey won his MA Senate primary victory on Tuesday in a landslide: 58-42! PDA activists from across the country working together made thousands of phone calls in support of Ed Markey under Mike Fox's leadership. We want to take a moment to thank all of you who helped out on this important election. In June 2013 Progressive Democrats of America assigned activists to deliver their material to almost every US Congressman and several Senators. Richard McElroy was assigned as contact for Rep. Markey. Boston Democratic Socialists of America endorsed Ed Markey, in the 2013 Senate primary against Stephen Lynch. Although their records overlap on many issues, and each has sometimes taken positions different from DSA, we believe Markey is the clear progressive choice, especially on foreign policy, abortion choice and the environment. He is a member of the Congressional Progressive Caucus and in 2011 voted for its Budget for All amendment; last year he supported the Budget for All nonbinding question which passed in 91 Massachusetts cities and towns. In the 1980s he was a Congressional leader of the Nuclear Freeze movement, and he remains an important voice on nuclear disarmament, as well as tax giveaways to Big Oil and climate change. It’s not surprising he is endorsed by Peace Action, MoveOn.org, NARAL and the League of Conservation Voters. Markey is a good candidate, not a great one. Lynch has rightly criticized him on his vote for NAFTA and similar trade deals, even if Lynch has supported some of them himself. While he has a labor voting record in the mid-90% range, unions representing telephone workers—IBEW and CWA—haven’t always felt Markey was on their side in conflicts with Verizon and de-regulation. And on a democratic resolution of the Israel-Palestine conflict or heading off a new war with Iran he often sides with AIPAC and the neo-conservatives—but then so do most Democrats and almost all Republicans. In May 2013, former Boston Democratic Socialists of America Treasurer Tom Canel invited DSAers to volunteer for day or evening phone banking to AFL-CIO members for the Ed Markey campaign at the Harvard Clerical and Technical Workers Union (which Tom helped organize). According to Eleanor LeCain, writing in the The Yankee Radical, a "true progressive is running for state representative" in Boston/Cambridge — Jay Livingstone — in a special election being held on Tuesday, May 28th, 2013. A Massachusetts native, Livingstone teaches at Northeastern University and operates his own law practice, standing up against employer discrimination. He has been a key organizer in the campaigns of Rep. Ed Markey, Sen. Elizabeth Warren, and Gov. Deval Patrick. As a "State Rep Jay will work hard for quality, affordable public education; increased funding for at-risk youth, the disabled and the elderly; improved public transportation; and sensible development that works for small businesses and preserves the quality of neighborhood life". He has been endorsed by Progressive Democrats of Massachusetts and Boston Democratic Socialists of America — among many others. The Alliance for Retired Americans Political Action Fund endorsed Edward Markey in 2014, also 2012. Senator Ed Markey received money from the Iranian American Political Action Committee during the 2014 election cycle. In August 2015, Senator Ed Markey announced his support for the Iran deal that would let the Iran inspect its own Parchin nuclear weapons research site, conduct uranium enrichment, build advanced centrifuges, buy ballistic missiles, fund terrorism and have a near zero breakout time to a nuclear bomb. Al Franken, another IAPAC backed politician who also benefited from Iran Lobby money, came out for Iran deal as well. Senator Jeanne Shaheen, the Iran Lobby’s third Democratic senator, also came out for the deal even though she only got half the IAPAC cash that Franken and Markey received. As did Senator Kirsten Gillibrand, who had benefited from IAPAC money back when she first ran for Senator. September 4 2017 Ed Markey tweeted "Amazing crowd to honor our workers and families and to demand dignity and a #livingwage. #FightFor15" at Boston Labor day rally as he posed with the Chinese Progressive Association (Boston). State Attorney General Maura Healey, Sen. Ed Markey, philanthropist Barbara Lee, Sen. Elizabeth Warren, Mayor Martin Walsh and State Treasurer Deb Goldberg march down Commonwealth Avenue for the Women's March for America in Boston, 2017. Massachusetts Immigrant and Refugee Advocacy Coalition joined U.S. 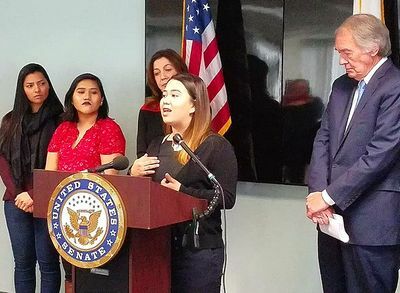 Senator Ed Markey and several Dreamers in a call for urgent action in Congress to enable DACA recipients to stay legally in the U.S.
January 3, 2018 – Estefany attended one of Boston’s best high schools and earned good grades, but even with DACA, she didn’t qualify for most forms of financial aid and had to struggle to find her way into college. With an Unafraid Scholarship and a second grant, she was able to enroll in UMass Boston, planning to major in international relations. On her first day of college, President Trump ended DACA. “That crushed my heart,” she said. Her status expires at the end of next semester. She can still study after that – but will she ever be able to pursue the career she’s working so hard for? February 2, 2017, a large protest was held in Copley Square against the ban on travelers from seven Muslim-majority countries. Protest organizers and guests spoke from the steps of Trinity Church. These speakers included Senators Elizabeth Warren and Ed Markey, CAIR - Massachusetts executive director John Robbins, and Cambridge City Councilman and MIT alumnus Nadeem Mazen. CAIR - Massachusetts February 23, 2017. It was a pleasure to meet with Senator Edward J. Markey yesterday, along with Cambridge City Councilor Nadeem Mazen and representatives from the Muslim Justice League and the Islamic Society of Boston Cultural Center (ISBCC), to discuss the needs of the Massachusetts Muslim community! — with Shannon Al-Wakeel, Nadeem Mazen, Ed Markey and John Robbins. US International Coalition for Human Rights in the Philippines (ICHRP) and the Asian American Resource Workshop are meeting with Senator Markey's staff next week, and we need to make sure he knows Massachusetts is watching! In the name of War on Terror and Drugs the president of the Philippines has conducted mass arrests and killings of the innocent. This spiked immediately after Trump's visit to the Philippines last year - including the killing of 72 year old Catholic priest Fr. Marcelito “Tito” Paez the day that he facilitated the release of a political prisoner and the massacre of indigenous peoples who were fighting the theft of their ancestral land by a corporation planting Nestle coffee. These heartbreaking incidents are supported by US tax dollars and just a few of many human rights abuses under Duterte, now totaling over 13k poor people killed in the Drug war, 140+ human rights defenders extra-judicially killed, and 300,000 primarily indigenous peoples and Moro people that remain displaced in Mindanao due to martial law. It is our hope that the Foreign Affairs Committee on East Asia and the Pacific will agree to host a Senate hearing. Senator Markey is the co-chair of the Foreign Affairs Committee on East Asia and the Pacific, so his support is key. Sign on to show your support, and we will bring the names of our supporters with us to our meeting with Senator Markey's staff! ICHRP US International Coalition for Human Rights in the Philippines added 6 new photos to the album: Lobbying and Public Forum in Boston — in Boston, Massachusetts. March 23 at 8:39am. The solidarity movement for the Philippines is growing. Members and supporters of the ICHRP US International Coalition for Human Rights in the Philippines and Malaya Movement in Boston successfully lobbied Massachusetts Senator Ed Markey and held an equally successful public forum on the human rights situation in the Philippines. US International Coalition for Human Rights in the Philippines March 23, 2018. Massachusetts residents, human rights advocates and Sen. Ed Markey's staff takes a group picture with a sign that says "We Are Activists not Terrorists" in solidarity with Filipino activists targeted by Duterte's crackdown on dissent. — in Boston, Massachusetts. Circa 2016 Carl Nilsson was Field Director for Ed Markey's Senate campaign. February 7 2019 Ed Markey introduced SR 59 (Green New Deal) alongside Alexandria Ocasio-Cortez's companion bill HR 109 in the House. ↑ MAPA, Ed Markey for Senate! ↑ Get on the Phones to Secure Victory for Ed Markey! ↑ PDA field report, We did it! Congrats Ed!